While nothing on the planet can touch the Intel Core i7 980X for sheer processing power, no one can really afford to buy the Intel six-core beast. Back in the real world and hot off the AMD production line comes a slew of new and price-perfect multi-core processors that we can all afford. The most eye-catching of these is the new six-core AMD Phenom II X6 1075T and brings six-core processing to the desktop for less than £190. With its 3.0GHz clock and 9MB cache it sits happily between the AMD Phenom II 1055T and the Black Edition AMD Phenom II 1070T running at 3.2GHz. 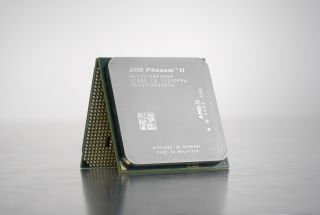 While the AMD Phenom II X6 might not be quite the fastest performer for gaming, it does put in some excellent all-round application performances. So if you're a heavy encoder or use heavily-threaded applications it's certainly something you should consider. Where AMD has really managed to get our over-worked credit card jumping for joy are the three new AMD Athlon II processors it has released. The first is the full quad-core Athlon II X4 645 running at 3.1GHz with 2MB of cache and retailing for less than £100. At this price it's one of the most able quad-core processors at this price point and considering you can drop it into your existing AM2+ motherboard it's a mean upgrade to boot. It would have your system competing with low-end AMD Phenom II X4 systems. Equally, for under £65, the AMD Athlon II X3 450 running at 3.2GHz is another bargain multi-core offering. For just under £60 there's the new AMD Athlon II X2 265 3.3GHz with 2MB of cache. That makes it the fastest budget dual-core processor around. It draws only 65 watts of power compared to the other 95 watt Athon II processors here, so it would make a better option for a media centre PC or download box. Even if AMD can't compete with Intel directly on performance, there's no doubt that these make excellent upgrade alternatives. If you want to build your own PC but aren't sure what works with what, Dabs has created the AMD Self Build Bundles. There's one for each of three user types – entry, mid and ultimate. Each has a processor, motherboard and memory in the box so you can always be sure everything will work together! And for Intel fans, Dabs also has Intel bundle deals available including a motherboard and processor. If you're improving your AM3 processor then don't forget to make sure you have enough memory installed. As there's no point having a faster CPU if it's having to hang around for your PC's memory to sort itself out. Currently Dabs has a week-long offer on the Corsair Memory XMS3 4GB (2x 2GB) DDR3 1600MHz kit. Usually this retails for just under £75, but currently it's on offer at £69.99 for this week only. So do your system a favour and give it a memory upgrade along the way.